Johnson JP, Kim TT, King WA: Image Guided Thoracoscopic Spine Surgery with the O-Arm: The Next Generation. Congress of Neurological Surgeons, Annual Meeting, 2010. Ghostine S, Vaynman S, Swartz KR, Brien EW, Samudrala S, Johnson JP: En-bloc Resection of a Large Sacral Chordoma facilitated by an Intra-operative Image-Guidance System (IGS). International Brain Mapping and Intraoperative Brain Surgical Planning Society. Annual Meeting, 2010. Ghostine S, Vaynman S, Schoeb JS, Cambron HO, King WA, Samudrala S, Johnson JP: Image-guided Thoracoscopic Resection of Thoracic Dumbbell Nerve Sheath Tumors. International Brain Mapping and Intraoperative Brain Surgical Planning Society. Annual Meeting, 2010. Scibelli S, Vaynman S, Ghostine S, Woods K, Samudrala S, Johnson JP: Cervical Kyphosis: A Novel Classification System and Operative Treatment Algorithm. American Association of Neurological Surgeons/Congress of Neurological Surgeons, Section on Disorders of the Spine and Peripheral Nerves, Annual Meeting, 2010. Johnson JP, Vaynman S, Zarrini P, Ghostine S, Sandhu HS, Samudrala S: A Novel Technique for Direct Reduction of Vertebral Compression Fractures (VCF): A Safety Study, Techniques, and Preliminary Clinical Data. American Association of Neurological Surgeons/College of Neurological Surgeons, Section on Disorders of the Spine and Peripheral Nerves, Annual Meeting, 2010. Ghostine S, Vaynman S, Scibelli S, Woods K, Samudrala S, Johnson JP: Pedicle Substraction Osteotomy- A Safe Alternative Surgical Technique to Treat Patients With Myelopathy Secondary to an Old Post-Traumatic Upper Thoracic Kyphotic Deformity. American Association of Neurological Surgeons/College of Neurological Surgeons, Section on Disorders of the Spine and Peripheral Nerves, Annual Meeting, 2010. Sheyn D, Pelled G, Gazit Z, Zarembinski CJ, Anand NA, Johnson JP, Gazit D: A Novel Platform for Anterior and Posterior Spinal Fusion using Injectable Adult Stem Cells. Spine Arthroplasty 7, Berlin, Mar 2007. Siddique K, Ghostine S, Perri B, Johnson JP. Sacral insufficiency fractures after lumbar fusion. 33rd Annual Richard Lende Winter Neurosurgery Meeting. Snowbird, Utah. Feb 2007. Johnson JP, Chuang S, Hunt LA, Anand N, Pashman R, Hedman T: Investigation of injectable Collagen Crosslinking as an Alternative and Adjunctive Procedure in Treatment of Spinal Deformity. Congress of Neurological Surgeons. October 2006. Johnson JP, Melamed H, Hunt LA, Pashman RS, Anand N, Wolcott PW: Asymmetric pedicle subtraction osteotomy with partial vertebrectomy for correction of fixed combined coronal and sagittal imbalance: a new twist on an old technique. American Association of Neurological Surgeons, San Francisco, CA, April 2006. Johnson JP, Melamed H, Hunt L, Pashman RS, Anand N, Wolcott WP: Asymmetric pedicle subtraction osteotomy with partial vertebrectomy for correction of fixed combined coronal and sagittal imbalance: a new twist on an old technique. Congress of Neurological Surgeons, Boston, Massachusetts, October 2005. Hamilton JF, Johnson JP, Anand N: Unilateral pedicle screws with cantilever transforaminal lumbar interbody fusion (TLIF) in the treatment of single-level degenerative scoliosis: case series with analysis of a novel surgical technique. Congress of Neurological Surgeons, Chicago, IL, October 2006. Hamilton JF, Pinillas-Arias D, Bilancini M, Miraliakbar H, Lauryssen C, Johnson JP: Addition of Cross-link to the C1 lateral mass/C2 pedicle screw fixation construct: a biomechanical study. Congress of Neurological Surgeons, Chicago, IL, October 2006. Johnson JP, Stokes JK, Oskouian RJ, Choi WW, King WA: Image-guided thoracoscopic spinal surgery: a merging of 2 technologies. Congress of Neurological Surgeons, Chicago, IL, October 2006. Pashman RS, Hadden A, Johnson JP: Differential concave and convex CSF flow in idiopathic scoliosis. International Meeting on Advanced Spine Techniques, Athens, Greece, July 2006. Johnson JP, Stokes JK, Oskouian RJ, Choi WW, King WA: Image-guided thoracoscopic spinal surgery: a merging of 2 technologies. Neurosurgical Society of America, Ojai, CA, June 2006. 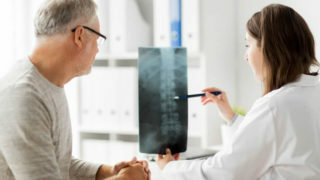 Villavicencio AT, Oskouian RJ, Roberson C, Stokes JK, Park J, Shaffrey C, Johnson JP: Thoracolumbar vertebral reconstruction after surgery for metastatic spinal tumors: long-term outcomes. AANS/CNS Section on Disorders of the Spine and Peripheral Nerves, Lake Buena Vista, FL, March 2006. Perri B, Oyelese A, Bray RS, Johnson JP: Strategies and techniques for correction of degenerative and post-surgical kyphotic deformity. AANS/CNS Section on Disorders of the Spine and Peripheral Nerves, Lake Buena Vista, FL, March 2006. Melamed H, Hunt L, Johnson JP, Pashman RS, Wolcott WP: Asymmetric pedicle subtraction osteotomy with partial vertebrectomy for correction of fixed combined coronal and sagittal imbalance: a new twist on an old technique. International Meeting on Advanced Spine Technologies (IMAST), Banff, Alberta, Canada, July 2005. Siddique K, Johnson JP: Spinal osteomyelitis: instrumentation and graft options. IMAST Annual meeting, Banff, Canada, July 2005. Wolcott WP, Johnson JP, Pashman RS, Bray RS, Anand N, Cambron HO: Sagittal alignment of the Bryan cervical artificial disc. Spine Arthroplasty 5, New York, NY, May 2005. Regan JJ, Miraliakbar H, Johnson JP, Lauryssen C, Bray R, Pashman RS, Goldstein T: Evaluation of the Learning Curve Associated with Artificial Disc Replacement: Analysis from the Prospective, Randomized, Multicenter FDA IDE Study of the CHARITÉ Artificial Disc. Spine Arthroplasty 5, New York, New York, May 5, 2005. Johnson JP, Lauryssen C, Cambron HO, Pashman RS, Regan JJ, Anand N, Bray RS: Sagittal alignment of the Bryan Cervical Artificial Disc. American Association of Neurological Surgeons, New Orleans, LA, April 2005. Perri BR, Miraliakbar H, Regan JJ, Johnson JP, Bray R, Goldstein T, Lauryssen C: Complications of Charite Artificial Disc Replacement: Analysis of 86 (148) single-site consecutive cases from the prospective FDA IDE trial. American Association of Neurological Surgeons/Congress of Neurological Surgeons Joint Section on Disorders of the Spine and Peripheral Nerves, Phoenix, Arizona, Mar 2005. Perri B, Oyelese A, Bray RS, Johnson JP: Strategies for correction of cervical kyphosis. Richard Lende Winter Neurosurgery Conference, Snowbird, UT, January 29, 2005. Perri BR, Oyelese T, Bray R, Johnson JP: Surgical correction of cervical kyphosis. Richard Lende Winter Neurosurgery Conference, Snowbird, Utah, Jan 29-31, 2005. Siddique K and Johnson JP: Options for surgical treatment of spinal osteomyelitis. Richard Lende Winter Neurosurgery Conference, Snowbird, UT, January 29, 2005. Johnson JP: Spinal deformity and the neurosurgeon. Western Neurological Society. San Diego, CA, September 14, 2004. Johnson JP: Total disc arthroplasty: current update AND spinal deformity and the neurosurgeon. Rocky Mountain Neurosurgical Society. Olympic Valley, CA, June 15, 2004. Johnson JP: Spinal deformity and the neurosurgeon. Neurosurgical Society of America. Santa Fe, New Mexico, June 9, 2004. Johnson JP: Thoracic endoscopic spinal surgery. Rocky Mountain Neurosurgical Society, Big Sky, MT, June 2003. Johnson JP, Lauryssen C: Posterior atlantoaxial stabilization: an alternative to C1-2 transarticular screws. Rocky Mountain Neurosurgical Society, Big Sky, MT, June 2003. Johnson JP: Posterior atlantoaxial stabilization: an alternative to C1-2 transarticular screws. Neurosurgical Society of America, Sunriver, OR, June 2003. Johnson JP, Pashman RS, Regan JR, Anand N, Rogers C: Management of upper thoracic and cervical-thoracic junction kyphotic deformities. AANS/CNS Joint Section on the Disorders of the Spine and Peripheral Nerves, Tampa, FL, March 2003. Johnson JP, Regan JR, Stokes JK: Image guided thoracic spinal surgery. AANS/CNS Joint Section on the Disorders of the Spine and Peripheral Nerves, Tampa, FL, March 2003. Johnson JP, Oskouian R, Patel NP, Stokes JK: Surgical management of thoracic disc herniations: a prospective nonrandomized clinical study. AANS/CNS Joint Section on the Disorders of the Spine and Peripheral Nerves, Tampa, FL, March 2003. Kim KD, Babbitz JD, Johnson JP: Anterior cervical fractional interspace decompression: a clinical series. Joint Section on the Disorders of the Spine and Peripheral Nerves, Phoenix, AZ, February 2001. Patel NP, Johnson JP, Choi WW, Wright NM: Forestier’s Disease associated with a retro-odontoid mass causing cervicomedullary compression. North American Skull Base Society, Lake Buena Vista, FL, February 2001. Johnson JP, Filler AG, McBride DQ: Endoscopic thoracic discectomy. Richard Lende Winter Neurosurgery Conference, Snowbird, UT, February 2001. Johnson JP, Obasi CN, Park J, Hahn MS, Kim KD, Masciopinto JE: Image-guided thoracic pedicle screw placement: early clinical experience. Richard Lende Winter Neurosurgery Conference, Snowbird, UT, February 2001. Bloch O, Holly L, Rogers CD, Johnson JP: Evaluation of registration techniques for spinal frameless stereotaxy. Richard Lende Winter Neurosurgery Conference, Snowbird, UT, February 2001. Patel NP, Johnson JP, Choi WC, Wright NM, Verity MA: Forestier’s disease associated wit retro-odontoid mass causing cervico-medullary compression. Richard Lende Winter Neurosurgery Conference, Snowbird, UT, February 2001. Patel NP, Johnson JP, Choi WC, Wright NM, Verity MA: Forestier’s disease associated wit retro-odontoid mass causing cervico-medullary compression. North American Skull Base Society, Lake Buenta Vista, FL, February 2001. Johnson JP: Thoracoscopic discectomy. Western Neurological Society, Mauna Lani Bay, HI, September 2000. Johnson JP: Image guided spinal surgery. Rocky Mountain Neurosurgical Society, Girdwood, AK, June 2000. Johnson JP: Transthoracic video-assisted endoscopic discectomy. Rocky Mountain Neurosurgical Society, Girdwood, AK, June 2000. Johnson JP: Third generation of anterior spinal instrumentation. Richard Lende Winter Neurosurgery Conference, 26th Annual Meeting, Snowbird, UT, January-February 2000. Johnson JP: Image guided spinal surgery. Richard Lende Winter Neurosurgery Conference, 26th Annual Meeting, Snowbird, UT, January-February 2000. Johnson JP: Are too many spinal fusions being performed? Richard Lende Winter Neurosurgery Conference, 26th Annual Meeting, Snowbird, UT, January-February 2000. Johnson JP, Filler AG, McBride DQ, Batzdorf U: Anterior cervical foraminotomy for unilateral radiculopathy. Western Neurological Society, Coeur d’Alene, ID, September 1999. Kyung MR, Rajabrata S, Johnson JP, Desalles AAF, Machleder HI, Ahn SS: Hyperhidrosis: is the condition hereditary? Joint Annual Meeting of NA-ISCVS/SVS, San Diego, CA 1998. Johnson JP, Masciopinto JE, Kim KD: Thoracoscopic disc surgery. Western Neurological Society, Napa, CA, September 1998. Johnson JP, Masciopinto JE, Kim KD: Thoracoscopic disc surgery: techniques and preliminary results. Richard Lende Winter Neurosurgery Conference, 24th Annual Meeting, Snowbird, UT, February 1998. Johnson JP, Choi WW, Masciopinto JE, Kim KD, Filler AG, McBride DQ, Gelabert H: Simultaneous anterior and posterior thoracic spinal reconstruction: prospective comparison with staged thoracic spinal reconstruction. Richard Lende Winter Neurosurgery Conference, 24th Annual Meeting, Snowbird, UT, February 1998. Kim KD, Masciopinto JE, Johnson JP: Thoracic pedicle screw placement using frameless stereotaxy. Spine+Science+Management Meeting, New Orleans, LA, November 14, 1997. Filler AG, Villablanca P, Lufkin RB, Prager J and Johnson JP: MR Neurography and open MRI in management of pyriformis syndrome. North American Spine Society, New York, NY, October 1997. Filler AG, Johnson JP, Machleder H, Trent J, Villablanca P, Lufkin RB, Tsuruda JS, Hayes CE, Maravilla K, Kliot M: MR Neurography in diagnosis of thoracic outlet syndrome. American Neurological Association, 122nd Annual Meeting, San Diego, CA, September-October 1997. Johnson JP, Ahn SS, DeSalles AAF, Filler AG: Thoracoscopic sympathectomy: long-term outcome analysis. Congress of Neurological Surgeons, New Orleans, LA, September-October 1997. Choi WW, Johnson JP, Filler AG, McBride DQ, and Sandhu HS: Simultaneous versus staged anterior and posterior spinal reconstruction: a comparative study. Congress of Neurological Surgeons, New Orleans, LA, September-October 1997. Johnson JP, Masciopinto JE and Batzdorf U: Syringomyelia and spinal deformity. Congress of Neurological Surgeons, New Orleans, LA, September-October, 1997. Johnson JP and Choi, WW: Outpatient versus inpatient lumbar disc surgery: a cost comparison. Congress of Neurological Surgeons, New Orleans, LA, September-October, 1997. Johnson JP, Ahn SS, DeSalles AAF, Filler AG: Thoracoscopic sympathectomy. Western Neurological Society, Ojai, CA, September 1997. Medin PM, Solberg TD, DeSalles AAF, Selch MT, Johnson JP, Smathers JB, Cosman ER: A minimally invasive method for fractionated stereotactic spinal radiotherapy. Medical Physics, Vol. 24, No. 6, June 1997. Medin PM, Solberg TD, DeSalles AAF, Selch MT, Johnson JP, Smathers JB, Cosman ER: A minimally invasive method for fractionated stereotactic spinal radiosurgery. International Stereotactic Radiosurgery Society. Madrid, June 1997. Filler AG, Johnson JP, Machleder H, Jabour BA, Trent J, Kioumehr F, Villablanca P, Lufkin RB, Tsuruda JS, Hayes CE, Maravilla K, Kliot M.: Image findings with MR neurography in diagnosis of thoracic outlet syndrome. International Society for Magnetic Resonance in Medicine, 5th Annual Meeting, Vancouver, B.C., April 1997. Johnson JP: Outpatient lumbar microdiscectomy: a cost analysis. Winter Neurosurgical Conference. Alberta, Canada. March 1997. Johnson JP, Filler AG, Pare LS, McBride DQ and Batzdorf U: Anterior cervical foraminotomy. Winter Neurosurgical Conference. Alberta, Canada. March 1997. Johnson JP, Filler AG, Pare LS, McBride DQ and Batzdorf U: Anterior cervical foraminotomy. Joint Section on Disorders of the Spine and Peripheral Nerves, Newport Beach, CA, February 1997. Johnson JP, Filler AG, Pare LS, McBride DQ and Batzdorf U: Anterior cervical foraminotomy. Richard Lende Winter Neurosurgery Conference, Snowbird, UT, February 1997. Medin PM, Solberg TD, DeSalles AAF, Selch MT, Johnson JP, Smathers JB, Cosman ER: A minimally invasive method for fractionated stereotactic spinal radiosurgery. American Association of Physicists in Medicine, 1997. Medin PM, Solberg TD, DeSalles AAF, Selch MT, Johnson JP, Smathers JB, Cosman ER: A minimally invasive method for fractionated stereotactic spinal radiosurgery. Third Congress Meeting fo the International Stereotactic Radiosurgery Society, Madrid, Spain, 1997. Filler AG, Johnson JP, Farahani K and Lufkin R: Neurography of the lumbar and sacral spinal nerves: three dimensional turbo spin echo imaging with phased array coils. North American Spine Society, Vancouver, Canada, Oct 1996. Filler AG, Howe FA, Farahani K, Johnson JP, Griffiths JR, Kennedy A, Lufkin RB, Haynor DR, Maravilla K, Goodkin R, Hayes CE, Tsruda JS and Kliot M: Diagnosis of brachial plexus pathology by magnetic resonance neurography. American Society of Neuroradiology, Seattle, WA, June 1996. Ahn SS, Concepcion B, Clem MF, Hiyama DT, Fuchs DT, Johnson JP et al: Laparoscopic aortic surgery. International Society for Vascular/Cardiovascular Surgery, Chicago, IL, June 1996. Johnson JP, Ahn SS, DeSalles AAF et al: Thoracoscopic sympathectomy. Rocky Mountain Neurosurgical Society, Telluride, CO, June 1996. Filler AG, Farahani K, Harris Y, Lufkin RB and Johnson JP: Turbo spin echo for MR neurography. American Roentgen Ray Society, San Diego, CA, May 1996. Johnson JP, Ahn SS, DeSalles AAF, Macleder HI and Moore WS: Thoracoscopic sympathectomy. (Presented to the General Session) America Association of Neurological Surgeons, Minneapolis, MN, Apr 30, 1996. Farahani K, Filler AG, Atkinson P, Johnson JP, and Lufkin RB: Magnetic resonance neurography of the lumbar spine: application of high resolution 3-D turbo spin echo imaging. International Society for Magnetic Resonanace in Medicine, 4th Annual Meeting, New York, NY, Apr 1996. Ahn SS, Hiyama DT, Fuchs GJ, Concecion C, Ro KM, Rudkin G, and Johnson JP: Laparoscopic aorto-bifemoral bypass: a case report. Periperal Vascular Surgery Society Meeting, Park City, UT, Jan 1996. Johnson JP, Ahn SS, DeSalles AAF, Frazee JG, Machleder HI and Moore WA: Thoracoscopic sympathectomy. Lende Winter Neurosurgical Conference, Snowbird, UT, Feb 1996. Johnson JP, Sloan AE, Alexander MJ, Black KB and Canalis RF: Transoral modifications. Rocky Mountain Neurosurgical Society, Sun Valley, ID, June 1995. Johnson JP and Torres RA: Vertebral body replacement. Lende Winter Neurosurgery Meeting. Snowbird, UT, Feb, 1995. Johnson JP, Sloan AE, Alexander MJ and Canalis RF: Modifications of the transoral approach. Lende Winter Neurosurgery Meeting. Snowbird, UT, Feb 1995. Johnson JP, Sloan AE, Alexander MJ and Canalis RF: Modification of the transoral approach for craniovertebral junction lesions. Joint Spine Section Meeting of AANS/CNS. Phoenix, AZ, Feb 1995. Sloan AE, Alexander MJ, Johnson JP, Sercarz J, Canalis RF and Black KL: Labiomandibular modification of the transoral approach for craniovertebral junction lesions. North American Skull Base Society Meeting, Naples, FL, Feb 1995. Sloan AE, Alexander MJ, Johnson JP, Sercarz J, Canalis RF and Black KL: The transmandibular, translingual, transoral modification of the transoral approach to clival and craniovertebral junction lesions. American College of Surgeons-Southern California Chapter, Indian Wells, CA, Jan 1995. Johnson JP and Torres RA: Vertebral body replacement. Rocky Mountain Neurosurgical Society, Snowmass, CO, June 1994. Johnson JP: Vertebral body replacement. Neurosurgery of the Rockies, Vail, Colorado, March 1994. Johnson JP, Batzdorf U: Tuberculous spinal arachnoid cysts: diagnosis and management. Joint Spine Section of the AANS and CNS, Ft Lauderdale, FL, February 1994. Johnson JP and Batzdorf U: Anterior cervical fusion for vertebrectomy without instrumentation. Joint Spine Section AANS and CNS, Ft Lauderdale, FL, February 1994. Johnson JP and Batzdorf U: Anterior cervical vertebrectomy and fusion without instrumentation. Lende Winter Neurosurgical Conference, Snowbird, Utah, February 1994. Johnson JP, King WA, Mei Z, Becker DP: Clinical microsurgical anatomy of the superior orbital fissure, Rocky Mountain Neurosurgical Society, Flathead Lake, Montana, June 1993. Johnson JP, King WA, Mei Z, Becker DP: Microsurgical anatomy of the superior orbital fissure, Jerusalem Symposium on Surgery of the Skull Base, Jerusalem, Israel, March 1993. Johnson JP and Batzdorf U: A new technique for anterior cervical interbody fusion. Joint Spine Section AANS and CNS, Tucson, Arizona, February 1993. Johnson JP, Becker DP, King WA: Hearing preservation in acoustic neuromas. Western Neurosurgical Society. Whistler, British Columbia, Canada, September 1992. Johnson JP, Adelson PD, Martin N: Dissecting aneurysms in the vertebrobasilar system. Lende Winter Neurosurgical Conference. Snowbird, Utah, February 1992. DeSalles F, Swartz B, Delgado-Escueta A, Adelson PD, Johnson JP, Tomayasu U, Becker DP: Electrocorticography in the evaluation of epilepsy patients. American Epilepsy Society, Philadelphia, Pennsylvania, December 1991. DeSalles A, Swartz B, Delgado-Escueta A, Adelson PD, Johnson JP, Becker DP: Chronic and acute electrocorticogram in epilepsy surgery. Congress of Neurosurgery, Orlando, Florida, April 1991. Johnson JP, Black KB, Ammirati M, Hoover L, Becker DP: Surgical approach to lower clival chordomas by the transoral, median labiomandibular glossotomy. 1st Asian-Oceanian International Congress on Skull Base Surgery, Tokyo, Japan, June 1991. Black KL, Johnson JP: Surgical management of clival chordomas. American College of Surgeons, Southern California Chapter, San Diego, California, January 1991. Doberstein C, Martin NA, Caron M, Zane C, Johnson JP, Thomas K, Becker DP: Increased recognition of post traumatic cerebral vasospasm using transcranial doppler ultrasound and Xe-133 CBF monitoring. Intracranial Hemodynamic Meeting, San Francisco, CA, February 1991. Johnson JP, Martin NA, Becker DP: Comparison of Xe-133 cerebral blood flow and flowtronics thermal cerebral blood flow probe. Lende Winter Neurosurgical Conference, Snowbird, Utah, February 1990. Johnson JP, Alexander NJ: Refinement of the sperm penetration assay to assess male infertility. Oregon Research Forum, Portland, Oregon, May 1985. Johnson JP, Richards TC: The effects of hydroxyurea on cell migration in the crypts of mouse colon. Oregon Research Forum, Portland, Oregon, May 1983. Johnson JP, Chuang S, Hunt L, Anand N, Pashman RS, Hedman T: Investigation of Injectable Collagen Crosslinking as an Alternative and Adjunctive Procedure in the Treatment of Spinal Deformity. Congress of Neurological Surgeons Annual Meeting, Chicago, Illinois, October 2006. Johnson JP, Melamed H, Hunt LA, Pashman RS, Anand N, Wolcott WP: Asymetric pedicle subtraction osteotomy with partial vertebrectomy for correction of fixed combined coronal and sagittal imbalance: a new twist on an old technique. American Association of Neurological Surgeons, April 22-27, 2006, San Francisco, CA. Johnson JP, Melamed H, Hunt LA, Pashman RS, N, Wolcott PW: Asymmetric pedicle subtraction osteotomy with partial vertebrectomy for correction of fixed combined coronal and sagittal imbalance: a new twist on an old technique. American Association of Neurological Surgeons, San Francisco, CA, April 2006. Hamilton JF, Pinilla-Arias D, Bilancini, Miraliakbar H, Lauryssen C, Johnson JP: Addition of a cross-link to the C1 lateral mass/C2 pedicle screw fixation construct: a biomechanical study. American Association of Neurological Surgeons, San Francisco, CA, April 2006. Perri B, Oyelese A, Bray RS, Johnson JP: Strategies and techniques for correction of degenerative and post-surgical kyphotic deformity. American Association of Neurological Surgeons, San Francisco, CA, April 2006. Hamilton JF, Pinilla-Arias D, Bilancini, Miraliakbar H, Lauryssen C, Johnson JP: Addition of a cross-link to the C1 lateral mass/C2 pedicle screw fixation construct: a biomechanical study. AANS/CNS Section on Disorders of the Spine and Peripheral Nerves, Lake Buena Vista, FL, March 2006. Johnson JP, Melamed H, Hunt LA, Pashman RS, N, Wolcott PW: Asymmetric pedicle subtraction osteotomy with partial vertebrectomy for correction of fixed combined coronal and sagittal imbalance: a new twist on an old technique. AANS/CNS Section on Disorders of the Spine and Peripheral Nerves, Lake Buena Vista, FL, March 2006. Perri B, Oyelese A, Bray RS, Johnson JP: Strategies and techniques for correction of degenerative and post-surgical cervical kyphotic deformity. AANS/CNS Section on Disorders of the Spine and Peripheral Nerves, Lake Buena Vista, FL, March 2006. Wolcott WP, Patel NP, Johnson JP, Lewin M, McBride DQ, Batzdorf U: Esophageal injury rates in anterior cervical spine surgery: review of a large series and literature. American Association of Neurological Surgeons, San Francisco, CA, April 2006. Wolcott WP, Johnson JP, Lim JY, Cambron HO, Patel NP, Wright NM: Failure of lateral mass plate fixation in osteoporosis. American Association of Neurological Surgeons, San Francisco, CA, April 2006. Johnson JP, Melamed H, Hunt LA, Pashman RS, Anand N, Wolcott PW: Asymetric pedicle subtraction osteotomy with partial vertebrectomy for correction of fixed combined coronal and sagittal imbalance: a new twist on an old technique. American Association of Neurological Surgeons, San Francisco, CA, April 2006. Oyelese A, Perri B, Bray RS, Johnson JP: Strategies and techniques for correction of degenerative and post-surgical cervical kyphotic deformity. American Association of Neurological Surgeons, San Francisco, CA, April 2006. Johnson JP, Melamed H, Hunt LA, Pashman RS, Anand N, Wolcott PW: Asymetric pedicle subtraction osteotomy with partial vertebrectomy for correction of fixed combined coronal and sagittal imbalance: a new twist on an old technique. AANS/CNS Section on Disorders of the Spine and Peripheral Nerves, Lake Buena Vista, FL, March 2006. Bergey DL, Melamed HM, Pashman RS, Johnson JP: Pedicle Subtraction Osteotomy for Cervical-Thoracic Kyphosis: A New Approach. CSRS Annual Meeting, San Diego, CA, December 2005. Hamilton JF, Pinilla-Arias D, Bilancini M, Miraliakbar H, Lauryssen C, Johnson JP: Addition of a cross-link to the C1 lateral mass/C2 pedicle screw fixation construct: a biomechanical study. Cervical Spine Research Society, San Diego, CA, December 2005. Miraliakbar H, Johnson JP, Maccabi G, Stokes JK, Bray RS, Lauryssen C: C1-2 instrumented fusion using facet arthrodesis without posterior structural bone grafting: clinical results on a new technique. Cervical Spine Research Society, San Diego, CA, December 2005. Wolcott WP, Johnson JP, Lim JY, Cambron HO, Patel NP, Wright NM: Failure of lateral mass plate fixation in osteoporosis. Congress of Neurological Surgeons, Boston, Massachusetts, October 2005. Wolcott WP, Patel NP, Johnson JP, Lewin MG, McBride DQ, Batzdorf U: Esophageal injury rates in anterior cervical spine surgery: review of a large series and literature. Congress of Neurological Surgeons, Boston, Massachusetts, October 2005. Siddique K, Johnson JP: Surgical options for treatment of osteomyelitis. International Meeting on Advanced Spine Technologies (IMAST), Banff, Alberta, Canada, July 2005. Perri B, Oyelese A, Bray R, Johnson JP: Cervical kyphosis classification with strategies and techniques for correction of type-specific deformities. International Meeting on Advanced Spine Technologies (IMAST), Banff, Alberta, Canada, July 2005. Miraliakbar H, Johnson JP, Maccabi G, Stokes JK, Bray RS, Lauryssen: C1-2 fusion using facet arthrodesis without posterior structural bone grafting: a new technique. American Association of Neurological Surgeons, New Orleans, LA, April 2005. Johnson JP, Lauryssen C, Cambron HO, Pashman RS, Regan JJ, Anand N, Bray RS: Sagittal alignment of the Bryan cervical artificial disc. AANS/CNS Joint Section of the Disorders of the Spine and Peripheral Nerves, Phoenix, AZ, March 2005. Johnson JP, Bergey DL, Pashman RS: Pedicle Subtraction Osteotomy for Cervical Thoracic Kyphosis. Scoliosis Research Society, Argentina, Buenos Aires, September 2004. Johnson JP: Image guided endoscopic thoracic spinal surgery. American Association of Neurological Surgeons, Orlando, FL, May 2004. Johnson JP, Bergey D, Pashman RS: Pedicle subtraction osteotomy for cervical-thoracic kyphosis. American Association of Neurological Surgeons, Orlando, FL, May 2004. Lauryssen C, Johnson JP: Posterior atlantoaxial stabilization: a new alternative to C1-2 transarticular screws. American Association of Neurological Surgeons, Orlando, FL, May 2004. Johnson JP, Pashman RS, Regan JJ, Anand N: Management of cervical-thoracic junction kyphotic deformities. American Association of Neurological Surgeons, Orlando, FL, May 2004. Gregorian A, Maccabi G, Oskouian R, Lauryssen C, Johnson JP: Vascular complications in anterior thoracolumbar spinal reconstruction. Joint Section on Disorders of the Spine and Peripheral Nerves, San Diego, CA, March 2004. Johnson JP, Bergey D, Pashman RS: Pedicle subtraction osteotomy for cervical-thoracic kyphosis. Joint Section on Disorders of the Spine and Peripheral Nerves, San Diego, CA, March 2004. Johnson JP, Regan JJ, Stokes JK: Image guided endoscopic thoracic spinal surgery. Joint Section on Disorders of the Spine and Peripheral Nerves, San Diego, CA, March 2004. Johnson JP, Lauryssen C: Posterior atlantoaxial stabilization: a new alternative to C1-2 transarticular screws. Joint Section on Disorders of the Spine and Peripheral Nerves, San Diego, CA, March 2004. Johnson JP, Lauryssen C: Posterior atlantoaxial stabilization: a new alternative to C1-2 transarticular screws. North American Spine Society, San Diego, CA, October 2003. Johnson JP, Pashman RS, Regan JJ, Anand N, Rogers CD: Management of upper thoracic and cervcial-thoracic junction kyphotic deformities. Congress of Neurological Surgeons, Denver, CO, October 2003. Johnson JP, Bergey D, Pashman RS: Pedicle subtraction osteotomy for cervical-thoracic kyphosis. Congress of Neurological Surgeons, Denver, CO, October 2003. Johnson JP, Lauryssen C: Posterior atlantoaxial stabilization: a new alternative to C1-2 transarticular screws. Congress of Neurological Surgeons, Denver, CO, October 2003. Johnson JP, Regan JJ, Stokes JK: Image guided endoscopic thoracic spinal surgery. Congress of Neurological Surgeons, Denver, CO, October 2003. Johnson JP, Oskouian R, Patel NP, Stokes JK: Surgical management of thoracic disc herniations: a prospective nonrandomized clinical study. American Association of Neurological Surgeons, San Diego, CA, April 2003. Patel NPP, Wright NM, Johnson JP: 3D image thoracic spinal tumor resection and reconstruction. AANS/CNS Section on Disorders of the Spine and Peripheral Nerves, Tampa, FL, March 2003. Patel NPP, Johnson JP, Lewin M, McBride DQ, Batzdorf U: Esophageal injury associated with anterior cervical spine surgery. AANS/CNS Section on Disorders of the Spine and Peripheral Nerves, Tampa, FL, March 2003. Stokes JK, Villavicencio AT, Liu PC, Johnson JP: Posterior atlantoaxial stabilization: a new alternative to C1-2 transarticular screws. Congress of Neurological Surgeons, Philadelphia, PA, September 2002. Patel NPP, Johnson JP, Lewin M, McBride DQ, Batzdorf U: Esophageal injury associated with anterior cervical spine surgery. Congress of Neurological Surgeons, Philadelphia, PA, September 2002. Johnson JP, Stokes JK, Regan JJ: Thoracic endoscopic spinal surgery. Congress of Neurological Surgeons, Philadelphia, PA, September 2002. Johnson JP, Kim KD, Babbitz J, Pashman R, Patel NP, Wright NM, Obasi CN, Park J: Image guided thoracic screw placement. American Association of Neurological Surgeons, Chicago, IL, April 2002. Patel NP, Johnson JP, Choi WW, Wright NM: Forestier’s disease associated with a retro-odontoid mass causing cervicomedullary compression. American Association of Neurological Surgeons, Chicago, IL, April 2002. Lim JY, Obasi CN, Johnson JP: Failure of lateral mass plate fixation in patients with 3-column instability. American Association of Neurological Surgeons, Chicago, IL, April 2002. McBride DQ, Patel NP, Johnson JP, Lanman TH: Chronic cervical spine pain associated with intradiscal screws. American Association of Neurological Surgeons, Chicago, IL, April 2002. Johnson JP, Shahidi R, Saracen M: Image guided thoracoscopic spinal surgery. American Association of Neurological Surgeons, Chicago, IL, April 2002. Johnson JP, Kim KD, Babbitz J, Patel NP, Wright NM, Obasi CN, Park J: Image-guided thoracic pedicle screw placement: early clinical experience. Joint Section on Disorders of the Spine and Peripheral Nerves, Phoenix, AZ, Feb 2002. Johnson JP, Kim KD, Babbitz J, Patel NP, Wright NM, Obasi CN, Park J: Image-guided thoracic pedicle screw placement: early clinical experience. World Federation of Neurosurgical Society, Sydney, Australia, September 2001. Johnson JP, Filler AG, McBride DQ, Patel NP, Wright NM: Endoscopic thoracic discectomy. Congress of Neurological Surgeons, San Diego, CA, September-October 2001. Lim JY, Wright NM, Patel NP, Obasi CN, Johnson JP: Failure of lateral mass plate fixation in patients with 3-column instability. Congress of Neurological Surgeons, San Diego, CA, September-October 2001. Johnson JP, Kim KD, Babbitz J, Patel NP, Wright NM, Obasi CN, Park J: Image-guided thoracic pedicle screw placement: early clinical experience. Congress of Neurological Surgeons, San Diego, CA, September-October 2001. Patel NP, Johnson JP, Choi WW, Wright NM: Forestier’s Disease associated with a retro-odontoid mass causing cervicomedullary compression. Congress of Neurological Surgeons, San Diego, CA, September-October 2001. Patel NP, Wright NM, Virella AA, Johnson JP: MRI characteristics and the management of unstable Hangman’s Fractures. Congress of Neurological Surgeons, San Diego, CA, September-October 2001. Johnson JP, Kim KD, Babbitz J, Patel NP, Wright NM, Obasi CN, Park J: Image-guided thoracic pedicle screw placement: early clinical experience. World Congress of Neurosurgery, Sydney, Australia, September 2001. Holly LT, Johnson JP, Masciopinto JE, Batzdorf U: Treatment of posttraumatic syringomyelia with extradural decompressive surgery. World Congress of Neurosurgery, Sydney, Australia, September 2001. Holly LT, Bloch O, Kim KD, Obasi CN, Johnson JP: Image guided cervical pedicle screw placement. American Association of Neurological Surgeons, Toronto, Ontario, April 2001. Holly LT, Bloch O, Obasi CN, Johnson JP: Frameless stereotaxy for anterior spinal procedures. American Association of Neurological Surgeons, Toronto, Ontario, April 2001. Holly LT, Johnson JP, Masciopinto JE, Batzdorf U: Treatment of posttraumatic syringomyelia with extradural decompressive surgery. American Association of Neurological Surgeons, Toronto, Ontario, April 2001. Kim KD, Babbitz JD, Johnson JP, Bloch O, Masciopinto JE: Image-guided thoracic pedicle screw insertion: a cadaveric feasibility study. American Association of Neurological Surgeons, Toronto, Ontario, April 2001. Park J, Johnson JP: Evaluation of expansile laminoplasties for treatment of cervical spine stenosis. American Association of Neurological Surgeons, Toronto, Ontario, April 2001. Kim DH, Kam AC, Altaf U, Park J, Johnson JP: Anterior cervical fusion with the PEAK polyaxial anterior cervical plate system in 163. American Association of Neurological Surgeons, Toronto, Ontario, April 2001. Bloch O, Holly LT, Rogers CD, Johnson JP: Evaluation of registration techniques for spinal frameless stereotaxy. American Association of Neurological Surgeons, Toronto, Ontario, April 2001. Johnson JP, Obasi CN, Park J, Hahn MS, Kim KD, Masciopinto JE: Image-guided thoracic pedicle screw placement: early clinical experience. American Association of Neurological Surgeons, Toronto, Ontario, April 2001. Patel NP, Johnson JP: MR imaging and the management of unstable Hangman’s Fractures. American Association of Neurological Surgeons, Toronto, Ontario, April 2001. Obukhov SK, Nieto JH, Johnson JP: Anatomy of odontoid resection using an extreme lateral approach. Joint Section on Disorders of the Spine and Peripheral Nerves, Phoenix, AZ, February 2001. Bloch O, Rogers CD, Johnson JP: Evaluation of registration techniques for spinal frameless stereotaxy. Joint Section on Disorders of the Spine and Peripheral Nerves, Phoenix, AZ, February 2001. Patel NP, Johnson JP, Choi WW, Wright NM, Verity MA: Forestier’s Disease associated with a retro-odontoid mass causing cervicomedullary compression. Joint Section on Disorders of the Spine and Peripheral Nerves, Phoenix, AZ, February 2001. Patel NP, Wright NM, Johnson JP: MRI and the management of unstable Hangman’s Fractures. Joint Section on Disorders of the Spine and Peripheral Nerves, Phoenix, AZ, February 2001. Johnson JP, Filler AG, McBride DQ: Thoracoscopic discectomy: comparative outcomes. Joint Section on Disorders of the Spine and Peripheral Nerves, Phoenix, AZ, February 2001. Obasi CN, Johnson JP, Filler AG, Park J: Failure of screw-plate fixation in patients with osteoporosis and 3-column instability. Congress of Neurological Surgeons, San Antonio, TX, September 2000. Johnson JP, Obasi CN, Park J, Hahn MS, Kim KD, Masciopinto JE: Image guided thoracic pedicle screw placement: early clinical experience. Congress of Neurological Surgeons, San Antonio, TX, September 2000. Holly LT, Johnson JP, Masciopinto JE, Batzdorf U: Treatment of post-traumatic syringomyelia with extradural decompressive surgery. Congress of Neurological Surgeons, San Antonio, TX, September 2000. Park J, Johnson JP: Evaluation of open-door expansile laminoplasty for treatment of cervical stenosis. Congress of Neurological Surgeons, San Antonio, TX, September 2000. Johnson JP, Bloch O, Obasi CN, Holly LT, Park J, Kim KD, Villablanca JP: Image guidance and improved accuracy of C1-2 transarticular screw placement. Congress of Neurological Surgeons, San Antonio, TX, September 2000. Johnson JP, Hahn MS, Obasi CN, Park J, Masciopinto JE, McBride DQ, Batzdorf U: Anterior cervical foraminotomy for unilateral radiculopathy. American Association of Neurological Surgeons, San Francisco, CA, April 2000. Johnson JP, Obasi CN, Park J, Hahn MS, Glatleider P: Endoscopic thoracic sympathectomy. American Association of Neurological Surgeons, San Francisco, CA, April 2000. Park J, Obasi CN, Hahn MS, Johnson JP: Transthoracic video-assisted endoscopic discectomy. American Association of Neurological Surgeons, San Francisco, CA, April 2000. Park J, Obasi CN, Hahn MS, Johnson JP: Transthoracic video-assisted endoscopic discectomy. Joint Section on Disorders of the Spine and Peripheral Nerves, Palm Springs, CA, February 2000. Johnson JP, Obasi CN, Park J, Hahn MS, Glatleider P: Endoscopic thoracic sympathectomy. Joint Section on Disorders of the Spine and Peripheral Nerves, Palm Springs, CA, February 2000. Park J, Holly LT, Obasi CN, Johnson JP: Evaluation of open door expansile laminoplasty using titanium miniplates for treatment of cervical spine stenosis. Joint Section on Disorders of the Spine and Peripheral Nerves, Palm Springs, CA, February 2000. Holly LT, Johnson JP, Masciopinto JE, Batzdorf U: Treatment of post-traumatic syringomyelia with extradural decompressive surgery. Spine+Science+Management, New Orleans, LA, November 1999. Park J, Holly LT, Obasi CN, Johnson JP: Evaluation of open door expansile laminoplasty using titanium miniplates for treatment of cervical spine stenosis. Spine+Science+Management, New Orleans, LA, November 1999. Obasi CN, Johnson JP, Filler AF, Park J: Failure of screw-plate fixation in patients with osteoporosis and 3-column instability. Spine+Science+Management, New Orleans, LA, November 1999. Johnson JP, Hahn MS, Obasi CN, Choi WW, Filler AG, Sandhu H, McBride DQ, Gelabert H: Simultaneous versus staged APSR: a comparative study. Congress of Neurological Surgeons, Boston, MA, October 30-November 4, 1999. Johnson JP, Obasi CN, Choi WW, Ahn SS: Hyperhidrosis: a pedigree analysis. Congress of Neurological Surgeons, Boston, MA, October 30-November 4, 1999. Johnson JP, Hahn MS, Masciopinto JE, Kim KD: Thoracic disc surgery. Congress of Neurological Surgeons, Boston, MA, October 30-November 4, 1999. Bloch O, Obasi CN, Hahn MS, Johnson JP: Feasibility of frameless stereotaxy for anterior cervical procedures. Congress of Neurological Surgeons, Boston, MA, October 30-November 4, 1999. Johnson JP, Hahn MS, Obasi CN, Filler AG, McBride DQ, Batzdorf U: Anterior cervical foraminotomy for unilateral radicular disease. Congress of Neurological Surgeons, Boston, MA, October 30-November 4, 1999. Johnson JP, Masciopinto JE, Kim KD: Thoracoscopic discectomy: results of early experience. American Association of Neurological Surgeons, New Orleans, LA, April 24-29, 1999. Johnson JP, Masciopinto JE, Kim KD, Choi WW, McBride DQ, Gelabert H: Anterior and posterior thoracic spinal reconstruction: a study comparing simultaneous and staged procedures. American Association of Neurological Surgeons, New Orleans, LA, April 24-29, 1999. Johnson JP, Choi WW, Ahn SS: Hyperhidrosis: a pedigree analysis. American Association of Neurological Surgeons, New Orleans, LA, April 24-29, 1999. Johnson JP, Ahn SS, Kim KD, Filler AG, DeSalles AAF: Techniques and outcomes of thoracoscopic sympathectomy. American Association of Neurological Surgeons, New Orleans, LA, April 24-29, 1999. Johnson JP, Masciopinto JE, McBride DQ, Batzdorf U: Anterior cervical foraminotomy for unilateral radiculopathy. American Association of Neurological Surgeons, New Orleans, LA, April 24-29, 1999. Johnson JP, Bloch O, Kim KD, Masciopinto JE, Hahn MS, Villablanca JP: Image guidance improves the accuracy of C1-2 transarticular screws. American Association of Neurological Surgeons, New Orleans, LA, April 24-29, 1999. Bloch O, Johnson JP, Kim KD, Hahn MS: Feasibility of frameless stereotaxy for anterior cervical procedures. American Association of Neurological Surgeons, New Orleans, LA, April 24-29, 1999. Kim KD, Johnson JP, Coiteiro D, Masciopinto JE, Martin N, Palmer J: Bilateral far lateral exposure of the craniovertebral junction for ventral midline lesions. Joint Section on Disorders of the Spine and Peripheral Nerves, Lake Buena Vista, FL, February 10-13, 1999. Kim KD, Johnson JP, Bloch O, Masciopinto JE, Villablanca JP: Laboratory validation for thoracic pedicle screw placement with frameless stereotaxy. Joint Section on Disorders of the Spine and Peripheral Nerves, Lake Buena Vista, FL, February 10-13, 1999. Johnson JP, Masciopinto JE, McBride DQ, Batzdorf U: Anterior cervical foraminal surgery for unilateral radiculopathy. Joint Section on Disorders of the Spine and Peripheral Nerves, Lake Buena Vista, FL, February 10-13, 1999. Johnson JP, Masciopinto JE, Kim KD: Thoracoscopic discectomy: early experience. Joint Section on Disorders of the Spine and Peripheral Nerves, Lake Buena Vista, FL, February 10-13, 1999. Johnson JP, Ahn SS, Choi WW, Masciopinto JE, Kim KD, Filler AG, DeSalles AAF: Techniques and outcomes of thoracoscopic sympathectomy. Joint Section on Disorders of the Spine and Peripheral Nerves, Lake Buena Vista, FL, February 10-13, 1999. Johnson JP, Masciopinto JE, Kim KD, Choi WW, McBride DQ, Gelabert Hugh: Anterior and posterior thoracic spinal reconstruction: a study comparing simultaneous versus staged procedures. Joint Section on Disorders of the Spine and Peripheral Nerves, Lake Buena Vista, FL, February 10-13, 1999. Johnson JP, Choi WW, Ahn SS: A pedigree analysis of hyperhidrosis. Joint Section on Disorders of the Spine and Peripheral Nerves, Lake Buena Vista, FL, February 10-13, 1999. Bloch O, Johnson JP, Kim KD: Application of frameless spinal stereotaxy for anterior cervical procedures. Joint Section on Disorders of the Spine and Peripheral Nerves, Lake Buena Vista, FL, February 10-13, 1999. Kim KD, Johnson JP, Bloch O, Masciopinto JE, Saracen MJ, Villablanca JP: New software applications for interchangeable instrumentation in spinal stereotaxis. Medicine Meets Virtual Reality 7, San Francisco, CA, January 20-23, 1999. Medin PM, Solberg TD, DeSalles AAF, Cagnon CH, Selch MT, Johnson JP, Smathers JB, Cosman ER: A minimally invasive method for fractionated treatment of spinal malignancies with Linac stereotactic radiation therapy. North American Spine Society, San Francisco, CA, October 28-31, 1998. Masciopinto JE, Kim KD, Johnson JP, Choi WW, Filler AG, Sandhu HS, McBride DQ, Gelabert H: Simultaneous versus staged anterior and posterior spinal reconstruction: a comparative study. North American Spine Society, San Francisco, CA, October 1998. Masciopinto JE, Kim KD, Johnson JP, Filler AG, Pare LS, McBride DQ, Batzdorf U: Anterior cervical foraminotomy. Congress of Neurological Surgeons, Seattle, WA, October 28-31, 1998. Kim KD, Masciopinto JE, Villablanca JP, Johnson JP: Application of frameless stereotaxy for C1-C2 transarticular screw placement: a validation study. American Association of Neurological Surgeons, Philadelphia, PA., April 25-30, 1998. Bloch O, Masciopinto JE, Kim KD, Johnson JP: Universal dynamic instrument for interactive spinal stereotaxy. American Association of Neurological Surgeons, Philadelphia, PA, April 25-30, 1998. Masciopinto JE, Bloch O, Villablanca JP, Johnson JP: Frameless stereotaxy for cervical pedicle screw. American Association of Neurological Surgeons, Philadelphia, PA, April 25-30, 1998. Kim KD, Masciopinto JE, Johnson JP: Frameless stereotaxy for thoracic pedicle screw placement. Joint Section on Disorders of the Spine and Peripheral Nerves, Rancho Mirage, CA, February 1998. Kim KD, Johnson JP, Masciopinto JE: Frameless stereotaxy for C1-2 transarticular screw placement. Spine+Science+Management, New Orleans, LA, November 1997. Choi WW, Johnson JP, McBride DQ, Batzdorf U: Forestier’s disease associated with a retro-odontoid mass causing cervicomedullary compression. Congress of Neurological Surgeons, New Orleans, LA, September-October 1997. Johnson JP, Masciopinto JE, Batzdorf U: Syringomyelia and spinal deformity. Congress of Neurological Surgeons, New Orleans, LA, September-October, 1997. Johnson JP, Choi WW: Outpatient versus inpatient lumbar disc surgery: a cost comparison. Congress of Neurological Surgeons, New Orleans, LA, September-October, 1997. Johnson JP, Batzdorf U: Syringomyelia and spinal deformity. American Association of Neurological Surgeons, Denver, CO, April 1997. Johnson JP, Tabor EN, Filler AG, McBride DQ: Craniovertebral junction stabilization after transoral odontoidectomy. American Association of Neurological Surgeons, Denver, CO, April 1997. Johnson JP: Outpatient lumbar disc surgery: a cost analysis. American Association of Neurological Surgeons, Denver, CO, April 1997. Alsina GA, Johnson JP, McBride DQ: Spinal cysticercosis. Joint Section on Disorders of the Spine and Peripheral Nerves, Newport Beach, CA, February 1997. Fineman I, Johnson JP, Sandhu H: Spinal brown tumors in renal failure: pathophysiology and management. Joint Section on Disorders of the Spine and Peripheral Nerves, Newport Beach, CA, February 1997. Johnson JP, Ahn SS, Filler AG, DeSalles AAF, Frazee JG, Machleder HI, Moore WS: Thoracoscopic sympathectomy. Joint Section on Disorders of the Spine and Peripheral Nerves, Newport Beach, CA, February 1997. Medin PM, Solberg TD, DeSalles AAF, Selch MT, Johnson JP, Smathers JB, Cosman ER: A minimally invasive method for fractionated stereotactic spinal radiosurgery. World Congress on Medical Physics and Biomedical Engineering, Nice, France, 1997. Tabor EN and Johnson JP: Indications for atlanto-axial or occipital-cervical fusion after transoral odontoidectomy. North American Spine Society, Vancouver, Canada, Oct 1996. Johnson JP, Ahn SS, Filler AG, DeSalles AAF, Frazee JG, Machleder HI, and Moore WA:Thorascopic sympathectomy. Congress of Neurological Surgeons, Montreal, Canada, Sept 1996. Alexander MA, Johnson JP, Martin NA and Becker DP: Intracranial pressure monitoring in liver transplant patients. Congress of Neurological Surgeons, Montreal, Canada, Sept 1996. Johnson JP, Sloan AE, Alexander MJ, Black KB and Canalis RF: Modifications of the transoral approach for clival and craniovertebral junction lesions. Joint Spine Section of AANS/CNS, Orlando FL, Feb 1996. Johnson JP, Sloan AE, Alexander MJ, Black KB and Canalis RF: Modifications of the transoral approach for clival and craniovertebral junction lesions. AANS, Orlando, FL, Apr 1995. Johnson JP and Torres RA: MRI imaging after spinal reconstruction with titanium instrumentation in metastatic disease. AANS, Orlando, FL, Apr 1995. Torres RA and Johnson JP: Imaging of spinal metastases after titanium instrumentation. Joint Spine Section Meeting of AANS/CNS, Phoenix, AZ, Feb 1995. Johnson JP and Torres RA: Vertebral body replacement with titanium mesh cage. Joint Spine Section Meeting of AANS/CNS, Phoenix, AZ, Feb 1995. Citow JS, Johnson JP, Ammirati M, and McBride DQ: Diagnosis and management of intraventricular neurocysticercosis: report of 30 cases. CNS Annual Meeting, Chicago IL, Oct 1994. Johnson JP and Batzdorf U: Tuberculous spinal arachnoid cysts: diagnosis and management. AANS San Diego, CA, April 1994. Johnson JP, King WA, Mei Z, Becker DP: The superior orbital fissure: neurosurgical entrance to the orbit. AANS , San Diego, CA, April 1994. Johnson JP, King WA, Mei Z, Becker DP: Microsurgical anatomy of the superior orbital fissure. Congress of Neurological Surgeons, Vancouver, British Columbia, Canada, October 1993. Johnson JP, Adelson PD, Martin NA, Thomas K, Duckwiler G, Becker DP: Dissecting intracranial aneurysms of the posterior cerebral circulation: approach to diagnosis and management. AANS, New Orleans, Louisiana, April 1991. Johnson JP, Doberstein C, Martin NA, Becker DP: Thermal diffusion CBF in intraoperative and postoperative craniocerebral trauma patients. AANS, New Orleans, Louisiana, April 1991. Cheatham ML, Johnson JP, Becker DP: Anterior cervical interbody fusion using the Cloward surgical technique: a review of 456 patients and a 10 to 20 year follow-up. AANS, New Orleans, Louisiana, April 1991. Doberstein C, Martin NA, Caron M, Zane Z, Johnson JP, Thomas K, Becker DP: Detection of post-traumatic cerebral arterial spasm using transcranial doppler ultrasound and Xe-133 CBF monitoring. Congress of Neurosurgery, Los Angeles, California, October 1990. Doberstein C, Johnson JP, Martin NA, Becker DP: Comparison of cerebral blood flow-determined by thermal diffusion probes and intravenous Xe-133 measurements in postoperative neurosurgical patients. Congress of Neurosurgery, Los Angeles, California, October 1990.